Sally L. McElroy, age 84 went to be with her Lord and Savior on Sunday, March 17, 2019 at Ovid Healthcare Center. Sally was born on June 9, 1934 in Hillsdale, MI the daughter of Ward and Estella (Roush) Bly. She graduated from Hillsdale High School in 1952 and on March 14, 1953 she married William D. McElroy in Hillsdale. Sally worked for St. Johns Public School as a bus driver for several years. 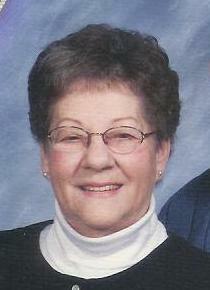 She was a member of Pilgrim United Methodist Church and loved playing the piano and being with her family. Survivors are her husband, William. Children, Ronald (Sharon) McElroy of DeWitt, John McElroy, Bill (Kathleen) McElroy and Kim (Ben) Swanchara all of St. Johns and Kelly (Larry) Ward of Minnesota. 12 grandchildren and 19 great grandchildren. Sister, Nancy Taylor of Hillsdale. A memorial service will be held at a later date. Memorials may be made to Pilgrim United Methodist Church. Arrangements by Keck-Coleman Funeral Home.